Drop me a line if you would like to hook up in Rangeley, Maine for some of the best fly fishing I have experienced anywhere. This time of year sees many large 2-4+ pound wild Brook Trout and Salmon move into the area rivers to feed on the abundant insect life in these remote and pristine rivers. These rivers are not stocked and all fish are wild. Maine offers the angler the opportunity to fish for trophy wild Brook Trout and Land Locked Atlantic Salmon. Maine is the last stronghold in the United Stated for catching trophy sized Native and wild Brook Trout occasionally reaching 5 lbs or more. Large Salmon and Brook Trout move out of the many area lakes and into rivers to feed in spring and spawn during the fall. During hatches in June and September, even the big brook trout and salmon will eat dry flies. The male Salmon above took a Hendrickson Dun during a nice hatch. This is truly a once in a lifetime experience. Trips are based out of the Rangeley, Maine area and we will fish surrounding rivers and ponds. Trips run a minimum of 2 days, and are only offered in June and September. Days will be 8-12 hours of fishing. Lodging and meals (other than lunch) are not included, but I can recommend some great cabin rentals or hotels in the area. 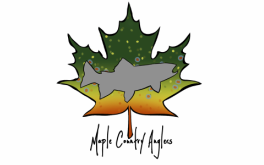 I have been a registered Maine guide for 8 years, and am certified in Fishing, Hunting, and Outdoor Recreation. Earning the Maine Guide patch is a coveted achievement in the Northeast. Guides are trained and examined in all aspects of outdoor activities, including Navigation, Boating and Canoeing, Map and Compass, Wilderness First Aid, Lost person scenario's, Client Care, and Outdoor Knowledge, and law and regulations. Candidates are required to complete a 600 question test in each discipline they are applying for, before being examined in person by a board of highly esteemed Maine Guides. Candidates only receive their license upon formal approval by the board. These are seasonal trips. Call or email for availability.